This is a private tour. We will assign private guides and vans in each city and no other participants will be allowed to join in your group. Also, the tour is totally flexible. You can start your own tour at anytime as you like. Moreover, if you would like to do any adjustment in this itinerary, please Email(ebiz@dditours.com) to tell us the area you are not satisfied with, we can adjust the itinerary according to your every request. On arrival in Beijing, you will be met & transferred by our professional English-speaking guide to your hotel. Enjoy the rest of the day at your convenience. Buffet breakfast at hotel. Free until be transferred to the airport for the flight to Pyongyang. On arrival, met and transferred to your hotel. Visit the Mansudae Grand Monument, Arch of Triumph, and Fountain Park. 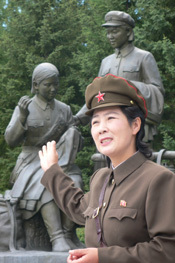 Visit to Kumsusan Memorial Palace (Mausoleum of Kim Il Sung), Revolutionary Martyrs’Cemetery. In afternoon, walk in the Moranbong Hill; visit the Kaeson Funfair, Mangyongdae Native House and Pyongyang Metro. Then, drive to Mt Myohyang in about 2 hours. Visit the International Friendship Exhibition (Hall of gifts to DPRK’s leaders), Buddhist Temple. In the afternoon, drive back to Pyongyang. Visit the Victorious Fatherland Liberation War Museum (Korean War Museum) and USS Pueblo. Drive to Kaesong in about 2.5 hours. Visit Panmunjom/DMZ and Kaesong Koryo Museum. In the afternoon, return to Pyongyang. Enjoy the Schoolchildren’s Palace performance; visit Juche Tower and Monument to Party Foundation. Buffet breakfast at hotel. Free until be transferred to the airport for the flight to Beijing. Note: Kindly be noted that the tour cost in Pyongyang part varies in a quite large range. We couldn’t indicate the accurate price as other regular tour packages. Please understand this. If you are interested in this tour, please advise your tour details. We’ll quote for you once we get your inquiry. The prices listed include a discount for cash payment either by wire transfer, or any other types of payment. The discount price may not apply and be subject to certain amount surcharge.